Paraffinic Froth Treatment (PFT) facilities produce a very clean diluted bitumen product, shipped on third-party pipelines to their final destination. In order to minimize the volume of solvent shipped, Solvent Recovery Units (SRUs) are used to flash and recycle the solvent back to the PFT process. In a Paraffinic Froth Treatment (PFT) process, a paraffinic solvent is used to remove water and solids from bitumen froth produced in Extraction. PFT Froth Settling Units (FSUs) produce an overflow mixture of solvent and bitumen, relatively free of water and fine solids, containing as much as 60% solvent by volume. Although this overflow product meets the specifications for pipeline transport, paraffinic solvent is not an ideal diluent. Solvent is quite expensive and not readily available on the open market. The use of condensate as a diluent is much more desirable for operators that sell a final diluted bitumen product. All PFT facilities are equipped with Solvent Recovery Units (SRU), where some or all of the solvent is removed from the bitumen/solvent mixture produced in the Froth Settling Units (FSUs). In some cases (such as Shell), a minimum volume of solvent is left behind for diluted bitumen transport. Facilities such as Kearl and Fort Hills instead strip out all of the solvent and add condensate prior to pipeline shipment to market. SRU design is based on traditional flash-columns which use temperature and pressure to separate the hydrocarbon phases. SRUs are similar in design to DRUs (diluent recovery units) used in upgrading or even atmospheric distillation units used in conventional oil refining. SRU circuits consist of flash columns and/or drums, where the bitumen/solvent feed from the FSU circuit is heated in stages, allowing for the solvent to be slowly vapourized. Vapourized solvent is then collected, condensed and recycled back to the FSU circuit. For facilities that need to remove all of the solvent, several flash columns or drums are needed in series in order to produce a solvent-free product. As solvent gets removed, viscosity of the bitumen mixture will increase, making it more difficult to flash the solvent. Temperature is therefore progressively increased in each stage, while the pressure is progressively reduced. If only some of the solvent is required to be removed, a single solvent recovery step may be sufficient. The final solvent removal step occurs in an SRU Flash Column, where steam is added directly to the column and feed flows down the vessel through a series of internal trays. The trays spread out the bitumen mixture, improving contact with steam, which flows up through the column. The final product from the SRU column can be quite hot (as much as 200°C) and needs to be cooled prior to storage or pipeline transport. Cooling is achieved through heat exchange with a lower temperature fluid that needs to be heated (typically the feed solvent/bitumen stream from the FSU circuit). Cooling water can be used for additional cooling, if required. Solvent has a relatively low flash point, making it much easier to recover versus naphtha used in Naphthenic Froth Treatment (NFT). As temperature of the vessel increases, more solvent will flash for a given pressure. However, if the pressure is too high, the flash point of the solvent increases as well, making solvent recovery less efficient. In cases where 100% of the solvent is desired to be removed, the pressure in each solvent recovery stage is therefore progressively reduced (as the temperature increases) in order to produce solvent-free bitumen. Pressure is maintained at the desired set-point by restricting flow of solvent vapour to the overhead system, normally using a pressure control valve. At Shell's Muskeg River and Jackpine operations, the SRU removes some of the solvent, leaving a bitumen product with about 30% solvent by volume. This minimum volume allows them to meets viscosity specifications for pipeline transport to the Scotford Upgrader, located 300 km away from the mine site. The upgrader strips out the remaining solvent, which is pipelined back to the mine. The adjacent Scotford Refinery ensures the returned solvent meets the desired specifications and tops up any make-up volumes required. In the Kearl Froth Treatment process, virtually all of the solvent is recovered within the SRU and recycled back into the PFT process. 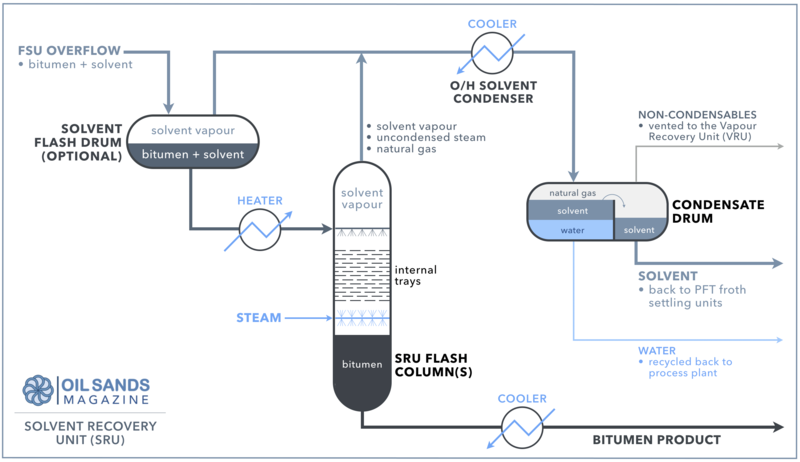 Natural gas condensate (diluent) is then added to the bitumen in order to meet pipeline specifications. The diluted bitumen is then sold directly to refineries across North America. The facility then purchases diluent on the open market, which is shipped on a dedicated pipeline. Small volumes of solvent can be left behind in the bitumen product (in the order of 1%). Make-up solvent is therefore required to be purchased from refineries and is typically trucked to site. SRUs are used all PFT facilities including Muskeg River, Jackpine, Kearl and the Fort Hills Froth Treatment circuits.